The fossil records of the burst track it back to one of the oldest, non-predatory frigates. Located deep in the heart of the Minmatar nebula, the Burst were first overlooked as being pseudo-spaceships due to their odd structure and lack of apparent behavior characteristics. It was not until a comprehensive catalog of flora was being done that the Burst was observed in action. 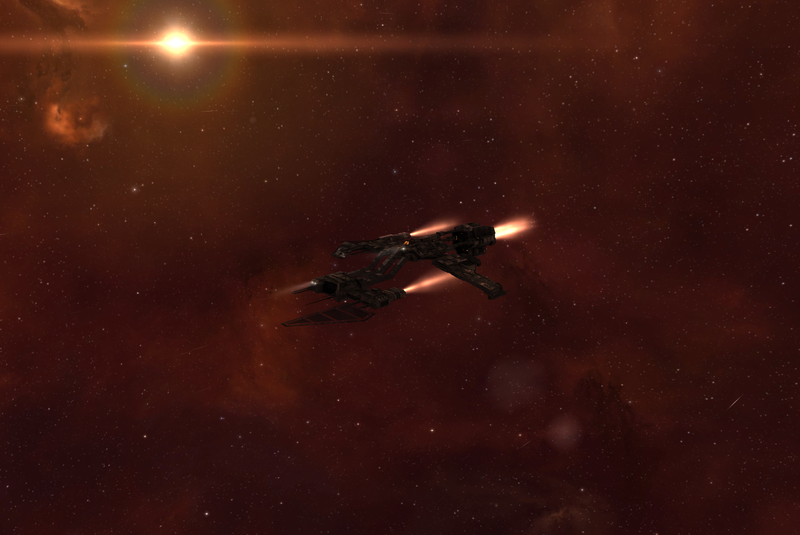 A larg group of cruisers sank deep into the thick, dust of the Nebula. At the heart of these clouds spaceships uses the dust to scrape parasites from their hulls. It was at this time that the first swarm of burst were seen covering a cruiser fleet. However, these small, flat spaceships were not attacking nor being attacked. Rich beams of energy flowed across the cruisers who held perfect still as the Bursts scraped their hulls clean and appeared to repair basic damage. There are a handful of spaceships that fit into the mutualism specialization. The Burst appears to have started its existence with a more herbivorous appetite to asteroids. However, do the the proliferation of a hybridized bioengineered frigate known as the Venture, the Burst had to adapt to survive. This has drawn it out of the heart of the Nebula. A highly social frigate that depends on others, Bursts have been seen to insinuate themselves into frigate and occasional cruiser fleets where they adopt the migratory patterns of their new fleet. Fragile and small Bursts use the thick, dust of the nebula as camouflage. The cleaning and repairs that they do tot he hulls of other spaceships appear to give them loose type of security. It appears that the flat structure of the Burst's exoskeleton allow it to hug large chunk of nebula debris as camouflage deep in the crimson depths of the Minmatar nebula. Not all spaceships allow the Burst neutrality and they often use their natural camouflage to good effect. The Burst is a well established species but rarely does it appear on the outer edges of the nebula. The largest concentrations are found deep in the heart of well established systems. However, with its habitat overrun, the Burst appears to have entered into a species wide colonization effort to the middle edges to the edges of the Minmatar nebula where it uses association for protection.